It sports a clean interface and simple preferences, aiming to do The Right Thing and What You Mean all of the time. It requires GNOME and GStreamer. 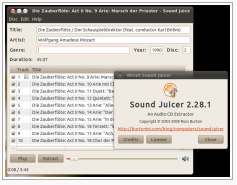 It can be installed in Ubuntu Software Center, by searching "Sound Juicer". gstreamer0.10-plugins-really-bad (not available in Debian) to encode to AAC.